For great, high-quality tint, turn to your LLumar home window tint dealer in Farmingdale. Help save on home energy bills, live more comfortably, and protect your family's privacy with home window tinting. For more than half a century, LLumar's residential window tints have offered homeowners increased protection from the sun's effects. Whether you live in a duplex, apartment, condo, or home, we're here to help you live a more comfortable life! At your home window tinting dealer, you'll find that our specially trained technicians have been handpicked to provide you with a great experience. Call your LLumar dealer in Farmingdale for a fast home window tint estimate! After our certified technicians in Farmingdale install your home window tint, you can better enjoy your space knowing that you're helping to protect your family from the sun's harsh rays, while also adding an extra layer of security. 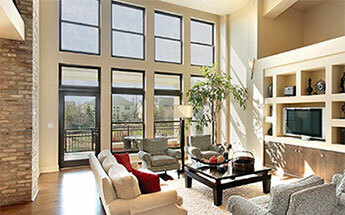 Residential tinting could help prevent the fading of flooring, cherished furnishings, and valuable artwork by the sun. It helps block close to 99% of the sun’s harmful ultraviolet rays that cause fading and discoloration. During the hotter months of the year, it helps keep every room in your Farmingdale home cooler and more comfortable. After having their residential window tint installed, many satisfied customers have even reported that their home energy costs have gone down by as much as 15%. Given that LLumar is a LEED-certified business, you could save an additional amount of money through tax credits and incentives in your area.